Chateau / Country House1453 sq. ft.
Idyllic retreat for families and for romantic getaways with easy access to unspoiled beaches, fun sports and traditional villages. 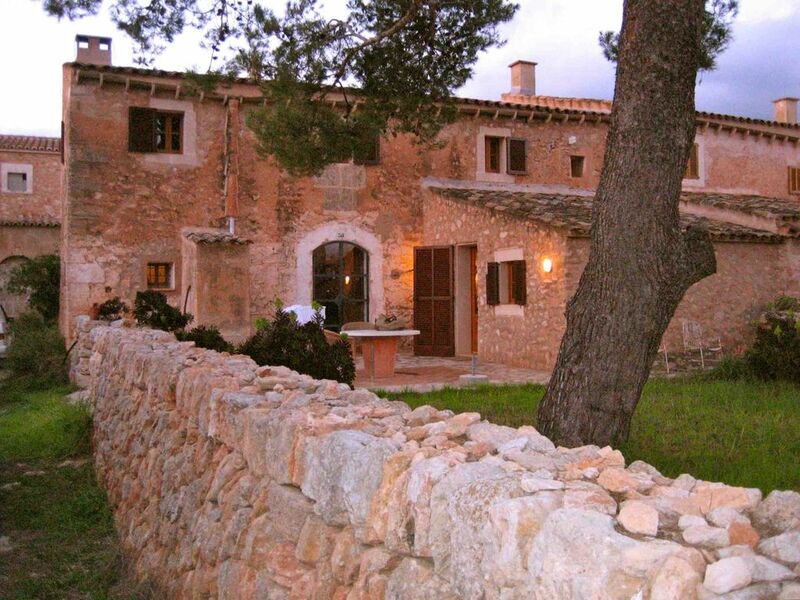 Once an ancient school, the finca has been refurbished in a traditional Mallorcan style keeping its original aura and guarantees a peaceful, comfortable and unforgettable holiday. Tastefully decorated with beautiful antiquities, contemporary furniture and artworks, it offers modern amenities such as Underfloor heating, AC, dishwasher, new TV, music system, washing room, etc) A place to enjoy rural Mallorca, visit the most stunning beaches and still be just a short drive from delicious restaurants, nightlife, golf courses and other tourist attractions or just to sit in front of the fire! The property has a master bedroom, a double bedroom and a studio equiped with large sofa bed, digital TV and stereo. Two airy modern bathrooms. Double living room with large lounge sofa, large dining table and original open fire. Open plan fully equiped kitchen. The outside round marble table with terrace chairs under an ancient pine tree looking at the garden is perfect for al fresco bbrunches and dinners. The back patio with laundry room and sun beds and garden furniture offers complete privacy to the guests. Babysitting, high chair, cots, toys and house keeping are available. After living in Monte Carlo, Bruxelles, London and Munich for some years, I came back to my home city in Spain ad found this paradise retreat to spend the holidays and come back restored and inspired. Decorated not as a rental house but as a holiday home with proper antiques and well selected contemporary furniture, artworks, china, linen, etc every detail including the hand wash products are looked after. This is not easily found in the area. Air conditioning has a symbolic daily fee to make sure that the Ac is used in an environmentally friendly way. Clean, comfortable, authentic, peaceful, lovely Mallorca experience. We look forward to having you back and we are very glad you enjoyed the house and the area as much as you do. The house was very easy to find coming from the airport thanks to the clear explanations of the owner. We were very well welcomed by Allrid who explained us all about the house. We found a very clean and so well furnished "home sweet home". We slept very well hearing only the rooster sometimes early in the morning. Good also to have the possibility to use the Air conditioning when needed. The location is ideal (a car is necessary) to be able to discover the surroundings. Nearly every day we found a new beach. Be careful to go quite early, not later than 10:00, if you want to find a parking place or even if you want to enjoy small beaches with blue crystal clear water before the maximum of other people. When saying that, I'm thinking of some little creeks. After lots of wonderful discover we have to say that the playa "Es Trenc" became one of our favorite. We went also up in the mountains to have beautiful views of the region and several time to visit the town of Palma. Don't miss the Cathedral. If arriving at 10:00 no need to queue to visit it. We discovered the beautiful little town of Santanyi with cute craftsmen boutiques and nice restaurants so that in Ses Salines. We also had lots of pleasure to spend time on the beach after the harbour of Colonia Sant Jordi to the Playa Es Dolc. We could easily return in this area and rent again the house. The contacts with the owner were very friendly and easy. Is really nice for us to hear that you have enjoyed the house and the surroundings as much as we do. Every time we come back after many years we keep discovering something new and new favorite places depending on the season. We would be very glad to have you back and that you feel there at home too. We wanted a relaxing chilled out holiday and that's exactly what we got. The house is charming and is exactly how it looks in the photo. It's spacious and very well equipped and is set in a small hamlet approximately 20 minutes from Palma airport and 10 minutes by car to the nearest beaches. We were met by Allrid who is lovely and looked after us during our stay. We hired bikes and some in the group would get up at dawn and cycle to the nearest beaches which are lovely (off the beaten track so not too touristy .) Ses Covetes and Platja des Ternc is beautiful - long streches of sand and blue shallow sea. There are also cafes and restaurants in Sa Rapita and another long stretch of beautiful sandy beach. The patio area at the house is perfect for morning breakfasts/evening meals when we decided not to eat out, and for lounging to read, drink wine and talk. Palma is definitely worth spending a day in - some great restaurants/ tapas bars and is approximately 20 minutes by car. In summary a lovely peaceful and relaxing holiday. thank you for leaving a comprehensive review. There is not much to add apart from that we are very much looking forward to see you again. Wir hatten hier wirklich Ferien! Sa Sorda liegt etwas abseits der Hauptstrassen, ab und zu kommen mal Autos vorbei, eher aber Radfahrer - und auch davon nicht viele. Das Haus liegt aber direkt am ausgezeichneten Radweg von Campos. Wir haben tolle Touren mit dem Rennrad hier starten können. Und nach der Rückkehr ein kühles Bier auf der schattigen Terrasse genossen. Natürlich muss man dazu nicht zwingend Rad fahren, es reicht auch, nach einem langen Sonnentag am Es Trenc, die fünf Minuten nach Hause zu fahren und dann den Abend zu geniessen. Grillen ist leider wg. der Brandgefahr nicht erlaubt, dafür wurde die Küche diesen Winter erneuert (nach Aussage der Vermieterin) und Märkte und Supermärkte in der Nähe (Auto erforderlich) bieten ein gutes Angebot zur Selbstversorgung. In der Nachbarschaft (ca. 10 min Autofahrt) finden sich aber auch zahlreiche wirklich gute Restaurants, man kann also auch "die Küche kalt lassen". Das Haus selbst bietet zwei grosse Schlafzimmer und zwei Wohnbereiche, die einen Aufenthalt bei schlechterem Wetter sicher auch angenehm machen, wir konnten allerdings zum Gluck immer draussen sitzen. Wir können das Haus empfehlen, werden wiederkommen und würden uns freuen, wenn es bis dahin vielleicht einen Gasgrill gibt, denn damit dürfte ja ein Waldbrand zu vermeiden sein. Übrigens sprechen die Vermieter Spanisch, Englisch und Deutsch und sind sehr hilfsbereit. Erneut ein traumhafter Aufenthalt wie zu Hause! Da wir ja bereits im Jahr zuvor in diesem Haus unseren Sommerurlaub verbracht hatten, kannten wir das Haus und die Umgebung, sowie die Betreuung bereits. Die Begrüssung war entsprechend herzlich! Wie bereits beim 1. Mal fühlten wir uns auf Anhieb wie zu Hause und sicher. Letzteres auch dank der Alarmanlage. Das Haus war gewohnt sauber. Es gab genügend Handtücher, auch für unseren Kleinen. Auch das Spielzeug war noch da, auch wenn das ein oder andere im Laufe der Zeit und der Spielenden etwas gelitten hatte. Wir haben uns bewusst für ein Haus ohne Pool abseits der üblichen Touristenpfade entschieden. Kein Pool aufgrund unseres Sohnes, um nicht mit der Angst zu leben, dass er versehentlich rein fällt, und etwas abseits, um die Ruhe geniessen zu können. Wir können das Haus mit gutem Gewissen weiter empfehlen, auch für Familien mit Kindern. Bezüglich Strand waren wir öfters in Colonia St. Jordi. Der dortige Strand ist gut geschützt, wenig Wellen und sehr flach. Und es gibt verschiedene Attraktionen vom Aquarium über Strandkaffees bis zu Ausflugsmöglichkeiten. Sollten wir ein Drittes Mal nach Mallorca reisen wollen, werden wir uns sicherlich wieder hier melden. Wir hatten eine tolle Zeit in diesem wunderschönen Haus. Das Haus ist sehr individuell und geschmackvoll eingerichtet und sehr gemütlich. Das Haus ist sehr gepflegt und perfekt ausgestattet. Unsere zwei Kinder (1 und 3 Jahre) haben sich auch sehr wohl gefühlt und haben in dem Haus, dem Garten und dem Hinterhof unzählige Spielmöglichkeiten gefunden. Das Haus liegt sehr sehr ruhig - Erholung pur. Das Haus ist sehr gut gelegen. Von hier aus hat man unzählige Möglichkeiten die Insel zu erkunden. Der Es Trenc Strand ist sehr nah und man ist auch schnell in netten kleinen Dörfchen wie Santanyi, Campos etc. Wir waren von Anfang bis Mitte Oktober dort und hatten nur schönes Wetter und konnten noch toll im Meer schwimmen. Wir können das Haus unbedingt empfehlen. Wir kommen sicher wieder! Vielen Dank für Ihre Beurteilung. Wir freuen uns, dass Sie die Zeit in Sa Sorda sehr genossen haben und freuen uns, Sie bald wieder zu begrüßen. A cleaning fee of 70/80 € will be charged depending on the number of people and you will pay it to the house keeper at your arrival. You can decide once there if you want to use the air conditioning or the heating in which case you will pay 10 € per day once there. There is a house keeper service to welcome and help guests with check in and check out. This person can be of assistance during the stay. She offers cleaning and baby sitting services as well as local advice on request. Bicycles are available for rental.